A new study by the U.S. Treasury Department finds that traffic snarls wasted 1.9 billion gallons of fuel last year ­ about 5% of the gas American motorists used. At the current price, that would work out to more than $7 billion nationwide. Other recent studies have indicated that Americans collectively waste about 5 billion hours in traffic, meanwhile, which works out to billions of dollars more in lost productivity. Worsening road congestion is wasting plenty of time and money – especially when you consider the rising cost of gas. A new study by the U.S. Treasury Department finds that traffic snarls wasted 1.9 billion gallons of fuel last year — about 5% of the gas American motorists used. At the current price, that would work out to more than $7 billion nationwide. Other recent studies have indicated that Americans collectively waste about 5 billion hours in traffic, meanwhile, which works out to billions of dollars more in lost productivity. In all, the study – prepared in support of the White House effort to upgrade the nation’s highway infrastructure – suggests the total cost in time and money works out to about $100 billion a year. The cost of poor quality roads, meanwhile, results in about $400 in added yearly maintenance costs for the typical urban driver. That runs as high as $756 annually for a motorist in the metropolitan San Jose areas, according to the report. The Obama Administration is hoping that the report will hope get members of the House of Representatives to finally act on a federal highway bill that has been stalled on Capitol Hill. The Senate has already passed a two-year measure that will fund infrastructure and transportation programs – and allow the government to continue collecting federal fuel taxes. House Republicans, however, have been pressing for a five-year, $260 billion measure – but it has so far failed to win enough support. If the House fails to act – or if the two sides of the Hill fail to come up with a compromise – before the end of the month all federal highway and transportation programs could come to a halt. Even fuel tax collection would be stopped. By some estimates, the impact could be as much as 2 million jobs. House Speaker John Boehner has shifted his position to support the Senate measure but it is unclear whether he can sway enough of his fellow GOP lawmakers. But there is growing pressure to reach that compromise. · Yet the U.S. spends less on transportation infrastructure than the majority of other major economies, such as Britain and Germany. For the U.S., it is just 2% of GDP compared to 5% in Europe. Fast-growing China is currently investing 9%, though that includes a push to create a roadway infrastructure. The study also reports that the use of highway ridership soared to 10.4 billion paid trips last year, up from about 8 billion in 1996. The vast majority of that growth has come on light and heavy rail systems. Ironically, the impact of traffic congestion might have been worse had it not been for the recession, which has seen millions of Americans thrown out of work. A separate study by Texas A&M University found that the number of hours Americans lost to traffic snarls slipped from a record 5.2 billion hours in 2007 – before the wholesale collapse of the economy – to just 4.6 billion the year after. The figure has only slowly been rising again as the economy recovers. On a personal level, the study found the average American losing more than 30 hours annually to traffic congestion, with the figure rising to more than 70 hours in cities like L.A., Washington, D.C., and Chicago. Traffic: Which Boston-area neighborhoods are to blame?Just a few areas have a huge effect on congestion, new research finds. SOURCE: “Understanding Road Usage Patterns in Urban Areas,” MIT and UC Berkeley. The dark blue on the map shows the neighborhoods whose residents spend the most time stuck in traffic. The red outlines identify 15 census tracts whose drivers disproportionately clog traffic, because they all tend to travel on the same small number of roads at the same time. When commuters from these census tracts clog the roads, the congestion ripples throughout the entire metro area, making everyone’s commutes longer. View full graphic. The scientists tracked anonymized information from more than 680,000 Boston-area drivers over three weeks. The engineers used commuters’ cellphone signals to locate the position of individual drivers. The study identifies the origin or “home” districts of the drivers according to the hours and locations of the calls. For the purposes of the study, a trip is occurring when the same mobile phone user is observed in two distinct zones within one hour. In rush-hour traffic, a single driver blocking the box can ruin everyone’s afternoon. But when you’re sitting on a backed-up road, cars stretching into the distance, the source of the gridlock is more of a mystery: Where’s the problem coming from? What’s true at a single intersection turns out to apply on a larger scale: It’s just a few drivers, relatively speaking, who jam things up for the rest of us. That’s the conclusion of a team of engineers from the Massachusetts Institute of Technology and the University of California, Berkeley, who have produced one of the most detailed maps of urban traffic patterns ever constructed. They did it by analyzing the cellphone records of 680,000 Boston-area commuters (they perform a similar analysis for the Bay Area). The call logs—which identify the towers used to transmit calls—allowed the researchers to trace each individual’s commute, anonymously, from origin to destination. The new technique represents a leap forward in traffic engineering. In the past, transportation officials in cities have used pen and paper surveys to study traffic patterns. These surveys are hard to administer and typically are only carried out once every few years. And while the data they produce are useful, they only capture the driving patterns of a small number of people over a short period of time. The cellphone records provided the engineers with a much more comprehensive picture of mass commuting patterns. What they found, perhaps surprisingly, is that during rush hour, 98 percent of roads in the Boston area were in fact below traffic capacity, while just 2 percent of roads had more cars on them than they could handle. These congested roads included short stretches of I-495 southbound and Route 128 southbound, a number of downtown streets, and a wide scattering of suburban arteries, such as Bridge Street in Lowell (southbound) and Water Street in Haverhill (northbound). Each of these roads has what the engineers term a high degree of “betweenness”—that is, they’re essential for connecting one part of the metropolitan area to the others. By tracking the cell records, they found that it’s just a small number of drivers from a small number of neighborhoods who are responsible for tying up the key roads. 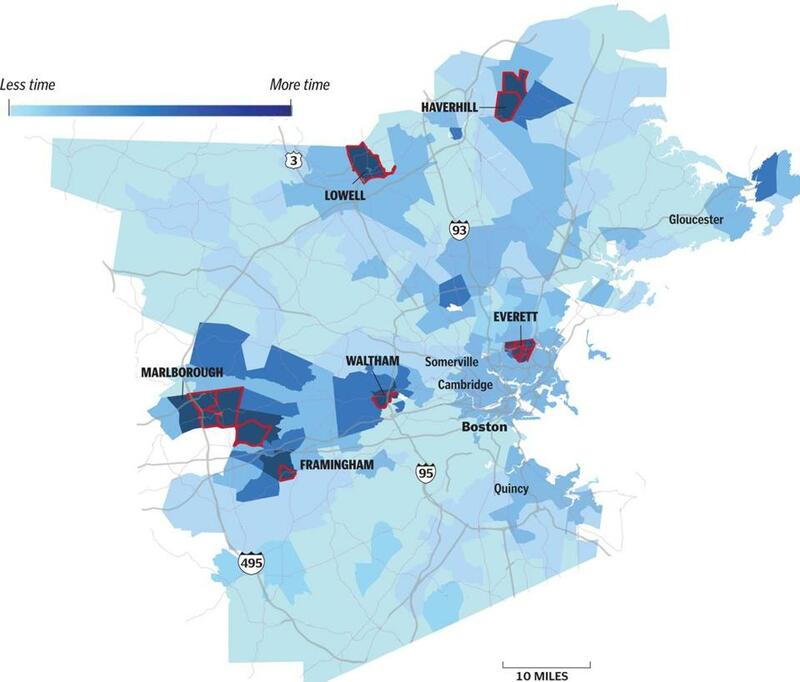 Specifically, they identified 15 census tracts (out of the 750 in Greater Boston) located in Everett, Marlborough, Lawrence, Lowell, and Waltham as the heart of the problem, because drivers from those areas make particularly intensive use of the problematic roads in the system. Besides letting us point the finger of blame, the research suggests a potential new approach to alleviating traffic: focus on those problem neighborhoods. The engineers calculate that if you were to reduce the number of car commuters from those 15 areas just 1 percent, all drivers across Boston would get home about 18 percent faster each night. Figure 1: Distributions of traffic flow, betweenness centrality and VOC in the two urban areas. (a) The one-hour traffic flow V follows a mixed exponential distribution for both Bay Area and Boston Area, where constants pA and pH are the fraction of arterial roads and the fraction of highways, vA and vH is the average traffic flow for arterial roads and highways respectively. (b) The distribution of road segment’s betweenness centrality bc is well approximated by , where the power-law distribution approximates arterial roads’ bc distribution and the exponential distribution approximates highways’ bc distribution. βH denotes the average bc of highways and αA is the scaling exponent for the power-law. (c) The volume over capacity VOC follows an exponential distribution P(VOC) = γe−VOC/γ with an average VOC = 0.28 for the two areas. Traffic flows in most road segments are well under their designed capacities, whereas a small number of congested segments are detected. For more statistical analysis of the fits, see the detailed discussion in SI section III.B. Figure 2: Tracing driver sources via the road usage network. (a) The colour of a road segment represents its degree Kroad. Most residential roads are found to have small Kroad, whereas the backbone highways and the downtown arterial roads are shown to have large Kroad. The light blue polygons and the light orange polygons pinpoint the MDS for Hickey Blvd and E Hamilton Ave respectively. The white lines show the links that connect the selected road segment and its MDS. The two road segments have a similar traffic flow V ~400 (vehicles/hour), however, Hickey Blvd only has 12 MDS located nearby, whereas E Hamilton Ave has 51 MDS, not only located in the vicinity of Campbell City, but also located in a few distant regions pinpointed by our methodology. (b) The degree distribution of driver sources can be approximated by a normal distribution with µsource = 1,035.9 (1,017.7), σsource = 792.2 (512.3), R2 = 0.78 (0.91) for Bay Area (Boston Area). (c) The degree distribution of road segments is approximated by a log-normal distribution with µroad = 3.71 (3.36) , σroad = 0.82 (0.72), R2 = 0.98 (0.99) for Bay Area (Boston Area). For more statistical analysis of the fits, see SI section III.B. Figure 3: Types of roads defined by bc and Kroad. The road segments are grouped by their betweenness centrality bc and degree Kroad. The red lines (connectors) represent the road segments with the top 25% of bc and Kroad; they are topologically important and diversely used by drivers. The green lines (peripheral connectors) represent the road segments in the top 25% of bc, but with low values of Kroad; they are topologically important, but less diversely used. The road segments in yellow are those with low values of bc, but within the top 25% Kroad; they behave as attractors to drivers from many sources (attractors). The road segments in grey have the low values of bc and Kroad, they are not topologically important and locally used (locals). Figure 4: A selective strategy based on the framework of road usage network shows better efficiency in mitigating traffic congestion. (a) The distribution of the additional time Te for each driver source is well approximated with an exponential distribution . Te is unevenly distributed in the two urban areas (also see Fig. S17). The maximum Te (Bay Area 3,562 minutes and Boston Area 1,037 minutes) is significantly larger than the average Te (204 minutes and 113 minutes respectively). (b) The total additional travel time reduction δT according to the trip reduction percentage m for the selective vs. the random strategy. The fits correspond to δT = k(m – b), where k is the slope of the linear fit, b is close to zero for all fits. For a detailed statistical analysis of the fits, see the discussion in SI section III.B. In an era of unprecedented global urbanization, society faces a rapidly accelerating demand for mobility, placing immense pressure on urban road networks1, 2. This demand manifests in the form of severe traffic congestion3, 4, which decreases the roads’ level of service, while at the same time increasing both fuel consumption5 and traffic-related air pollution6. In 2007 alone, congestion forced Americans living in urban areas to travel 4.2 billion hours more, purchase an additional 2.8 billion gallons of fuel, at a total cost of $87.2 billion3. To mitigate congestion in urban roads, urban planning1, traffic prediction7, 8, 9 and the study of complex networks10, 11, 12, 13, 14, 15 have been widely investigated potential influencing factors. However, without comprehensive knowledge of how roads are used dynamically, these studies are conventionally based on expensive and quickly outdated travel surveys or segmented information on traffic flow and travel time7, 8, 9, which fail to support the researchers with the information needed to cope with modern mobility demand. Up to now our understanding of the origins of the drivers in each road remained limited and not quantitatively solved. In this work we validate for the first time a methodology, which employs comprehensive mobile phone data to detect patterns of road usage and the origins of the drivers. Thus, providing a basis for better informed transportation planning, including targeted strategies to mitigate congestion3, 4. We formalize the problem by counting the observed number of individuals moving from one location to another, which we put forward as the transient origin destination (t-OD) matrix (Fig. S5, Fig. S11 and Supplementary Information (SI) section II.A). Traditionally, ODs are costly and difficult to obtain, because they are at best based on travel diaries made every few years, which quickly become obsolete and strongly rely on provided reports7, 8. In contrast, the rapidly increasing penetration rates and massive usage of mobile phones, with towers densely located in urban areas, can provide the most detailed information on daily human mobility16, 17, 18, 19, 20 across a large segment of the population19, 20, 21, 22, 23, 24, 25. Thus we use three-week-long mobile phone billing records generated by 360,000 San Francisco Bay Area users (6.56% of the population, from one carrier) and 680,000 Boston Area users (19.35% of the population, from several carriers) respectively. This data set is two orders of magnitude larger in terms of population and time of observation than the most recent surveys (Table S1), providing us with a source at an unprecedented scale to generate the distribution of travel demands. where A is the number of zones. W is the one-hour total trip production in the studied urban area, a number readily available for most cities. However this number gives no information about the trip distribution between zones, which we can enhance by the information gained via mobile phones. Directly from the mobile phone data we calculate Tij(n), which is the total number of trips that user n made between zone i and zone j during the three weeks of study. Via calibrating Tij(n) for the total population we obtain: , where Nk is the number of users in zone k. The ratio M scales the trips generated by mobile phone users in each zone to the trips generated by the total population living there: M(k) = Npop(k)/Nuser(k), where Npop(k) and Nuser(k) are the population and the number of mobile phone users in zone k. Furthermore to assign only the fraction of the trips attributed to vehicles, we correct Fallij by the vehicle usage rate, which is a given constant for each zone and therefore obtain Fvehicleij (see SI section II.A). For each mobile phone user that generated the t-OD, we can additionally locate the zone where he or she lives, which we define as the driver source. Connecting t-ODs with driver sources allows us for the first time to take advantage of mobile phone data sets in order to understand urban road usage. In the following, we present the analysis of the road usage characterization in the morning period as a case study. Results for other time periods are presented in SI (Fig. S19). A road network is defined by the links representing the road segments and the nodes representing the intersections. Using incremental traffic assignment, each trip in the t-OD matrix is assigned to the road network26, providing us with estimated traffic flows (Fig. 1a). The road network in the Bay Area serves a considerable larger number of vehicles per hour (0.73 million) than the one in the Boston (0.54 million). The traffic flow distribution P(V) in each area can be well approximated as the sum of two exponential functions corresponding to two different characteristic volumes of vehicles (Fig. 1a); one is the average traffic flow in their arterial roads (vA) and the other is the average traffic flow in their highways (vH). We measure (R2>0.99) with vA = 373 (236) vehicles/hour for arterials and vH = 1,493 (689) vehicles/hour for highways in the Bay Area (Boston numbers within parenthesis, pA and pH are the fraction of arterial roads and the fraction of highways). Both road networks have similar number of arterials (~20,000), but the Bay Area with more than double the number of highways than Boston (3,141 highways vs 1,267 in Boston) still receives the double of the average flow in the highways (vH) and a larger average flow in the arterial roads. The volume of vehicles served by a road depends on two aspects: the first is the functionality of the road according to its ability to be a connector based on its location in the road network (i.e. betweenness centrality) and the second is the inherent travel demand of the travelers in the city. The betweenness centrality bc of a road segment27, 28, 29, 30 is proportional to the number of shortest paths between all pairs of nodes passing through it: we measured bc by averaging over each pair of nodes, and following the shortest time to destination. The two road networks, analyzed here, have completely different shapes: the Bay Area is more elongated and connects two sides of a bay, while the Boston Area follows a circular shape (see Fig. 2a). But both have a similar function in the distribution of bc: with a broad term corresponding to the arterial roads and an exponential term to the highways, which is at the tail of larger bc. As Fig. 1b shows, we measure: P(bc) = pAPA(bc) + pHPH(bc) (R2>0.99), with for arterial roads and for highways. The highways in the Bay Area have an average bc of βH = 2.6 × 10−4, whereas a larger βH = 4.6 × 10−4 is found for the Boston Area highways, indicating their different topological structures. Interestingly, despite, the different topologies of the two road networks, the similar shapes of their distribution of traffic flows indicate an inherent mechanism in how people are selecting their routes. The exponential decay of VOC indicates that for both road networks traffic flows on 98% of the road segments are well below their designed road capacities, whereas a few road segments suffer from congestion, having a VOC > 1. The similarity between the two VOC distributions shows that in both urbanities drivers experience the same level of service, due to utilizing the existing capacities in the similar way. The traditional difficulty in gathering ODs at large scales has until now limited the comparison of roads in regard to their attractiveness for different driver sources. To capture the massive sources of daily road usage, for each road segment with V > 0, we calculate the fraction of traffic flow generated by each driver source, and rank these sources by their contribution to the traffic flow. Consequently, we define a road segment's major driver sources (MDS) as the top ranked sources that produce 80% of its traffic flow. We next define a bipartite network, which we call the network of road usage, formed by the edges connecting each road segment to their MDS. Hence, the degree of a driver source Ksource is the number of road segments for which the driver source is a MDS, and the degree of a road segment Kroad is the number of MDS that produce the vehicle flow in this road segment. As Fig. 2b shows, the driver source's degree Ksource is normally distributed, centered in < Ksource > ~1000 in both Bay Area and Boston Area, implying that drivers from each driver source use a similar number of road segments. In contrast, the road segment's degree Kroad follows a log-normal distribution (Fig. 2c), where most of the road segments have a degree centered in < Kroad > ~20. This indicates that the major usage of a road segment can be linked to surprisingly few driver sources. Indeed, only 6–7% of road segments are in the tail of the log-normal linked to a larger number of MDS, ranging from 100 to 300. In Fig. 2a we show a road segment's degree Kroad in the road network maps of the Bay Area and the Boston Area. Since census tracts and mobile phone towers are designed to serve similar number of population (Fig. S2), a road segment's degree Kroad quantifies the diversity of the drivers using it. We find that Kroad is lowly correlated with traditional measures, such as traffic flow, VOC and betweenness centrality bc (Fig. S15). For example, in Fig. 2a, Hickey Blvd in Daly City and E Hamilton Ave in Campbell City have a similar traffic flow V~400 (vehicles/hour), however, their degrees in the network of road usage are rather different. Hickey Blvd, only has Kroad = 12, with MDS distributed nearby, whereas E Hamilton Ave, has Kroad = 51, with MDS distributed not only in its vicinity, but also in some distant areas as Palo Alto, Santa Cruz, Ben Lomond and Morgan Hill. As Fig. 2a shows, the road segments in the tail of the log-normal (Kroad > 100) highlight both the highways and the major business districts in both regions. This again implies that Kroad can characterize a road segment's role in a transportation network associated with the usage diversity. To better characterize a road's functionality, we classify roads in four groups according to their bc and Kroad in the transportation network (see Fig. 3 and Fig. S16). We define the connectors, as the road segments with the largest 25% of bc and the attractors as the road segments with the largest 25% of Kroad. The other two groups define the highways in the periphery, or peripheral connectors, and the majority of the roads are called local, which have both small bc and Kroad (Fig. 3). By combining bc and Kroad, a new quality in the understanding of urban road usage patterns can be achieved. Future models of distributed flows in urban road networks will benefit by incorporating those ubiquitous usage patterns. This novel framework of defining the roads by their connections to their MDS can trigger numerous applications. As a proof of concept, we present here how these findings can be applied to mitigate congestion. For a road segment, its level of congestion can be measured by the additional travel time te, defined as the difference between the actual travel time ta and the free flow travel time tf. The drivers who travel through congested roads experience a significant amount of te. To pinpoint these drivers, the total Te per driver source is calculated. In contrast to the similar number of population served by each driver source (Fig. S2), the extra travel time Te generated by driver sources can be very different, following an exponential distribution (Fig. 4a). Some driver sources present a Te 16 times larger than the average. This finding indicates that the major traffic flows in congested roads are generated by very few driver sources, which enables us to target the small number of driver sources affected by this significantly larger Te. For the Bay Area, the top 1.5% driver sources (12 sources) with the largest Te are selected, for the Boston Area we select the top 2% driver sources (15 sources) (Fig. S17). We then reduce the number of trips from these driver sources by a fraction f, ranging from 2.7% to 27% in the Bay Area and from 2.5% to 25% in the Boston Area. The reduced numbers of trips correspond to the m total percentage of trips (m ranging from 0.1% to 1% for both areas). A benchmark strategy, in which trips are randomly reduced without identifying the driver sources with large Te, is used as reference. Our results indicate that the selective strategy is much more effective in reducing the total additional travel time than the random strategy. In the Bay Area, the total travel time reduction δT increases linearly with m as δT = k(m − b) (R2>0.90). We find that when m = 1%, δT reaches 26,210 minutes, corresponding to a 14% reduction of the total Bay Area additional travel time during a one hour morning commute (triangles in Fig. 4b). However, when a random strategy is used, the corresponding δT is only 9,582 minutes, which is almost three times less reduction than that achieved by the selective strategy (squares in Fig. 4b). Even better results are found in the Boston Area: using the selective strategy, when m = 1%, δT reaches 11,762 minutes, corresponding to 18% reduction of the total Boston Area additional travel time during a one hour morning commute (diamonds in Fig. 4b), while the random strategy results only in δT = 1,999 minutes, which is six times less the reduction of that achieved by the selective strategy (circles in Fig. 4b). The underlying reason for the high efficiency of the selective strategy is intrinsically rooted in the two discoveries described above: first that only few road segments are congested and second that most of those road segments can be associated with few MDS. Today, as cities are growing at an unparalleled pace, particularly in Asia, South America and Africa, the power of our modeling framework is its ability to dynamically capture the massive sources of daily road usage based solely on mobile phone data and road network data, both of which are readily available in most cities. Thus we validate for the first time an efficient method to estimate road usage patterns at a large scale that has a low cost repeatability compared to conventional travel surveys, allowing us to make new discoveries in road usage patterns. We find that two urban road networks with very different demand in the flows of vehicles and topological structures have the same distribution of volume over capacity (VOC) in their roads. This indicates common features in the organization of urban trips, which are well captured by the proposed bipartite network of road usage. Based on our findings, a new quality in the understanding of urban road usage patterns can be achieved by combining the traditional classification method of assessing a road's topological importance in the road network, defined by bc, with the novel parameter of a road's degree in the network of road usage, defined by Kroad. The values of Kroad and bc together determine a road's functionality. We find that the major traffic flows in congested roads are created by very few driver sources, which can be addressed by our finding that the major usage of most road segments can be linked to their own surprisingly few driver sources. We show the representation provided by the network of road usage is very powerful to create new applications, enabling cities to tailor targeted strategies to reduce the average daily travel time compared to a benchmark strategy. The most fundamental method to assign trips to road network is provided by the classic Dijkstra algorithm31. Dijkstra's algorithm is a graph search algorithm that solves the shortest path problem for a graph with nonnegative edge path costs (travel time in our case). However, the Dijkstra algorithm ignores the dynamical change of travel time in a road segment. Thus to incorporate the change of travel time, we apply the incremental traffic assignment (ITA) method26 to assign the t-OD pairs to the road networks. In the ITA method, the original t-OD is first split into four sub t-ODs, which contain 40%, 30%, 20% and 10% of the original t-OD pairs respectively. These fractions are the commonly used values32. The trips in the first sub t-OD are assigned using the free travel time tf along the routes computed by Dijkstra's algorithm. After the first assignment, the actual travel time ta in a road segment is assumed to follow the Bureau of Public Roads (BPR) function that widely used in civil engineering ta = tf(1 + α(VOC)β), where commonly used values α = 0.15 and β = 4 are selected32. Next, the trips in the second sub t-OD are assigned using the updated travel time ta along the routes computed by Dijkstra's algorithm. Iteratively, we assign all of the trips in the four sub t-ODs. In the process of finding the path to minimize the travel time, we record the route for each pair of transient origin and transient destination (see SI section II.B for more detail). Due to the lack of reliable traffic flow data at a global scale, we compare for each road segment the predicted travel time with the average travel time calculated from probe vehicle GPS data. According to the BPR function, the travel time of a road segment is decided by its traffic flow: a road segment's travel time increases with the increase of its traffic flow. Hence, obtaining the travel time from GPS probe data is an independent way to validate our result on the distribution of traffic flow. We find a very good linear relation Tprediction = kTprobe vehicle with both travel times obtained independently (the coefficient of determination R2>0.9 for all time periods, see SI section II.C for more detail). A driver source is calculated from the mobile phone data based on the regularity of visits of mobile phone users at each time of the day20. This regularity is time dependent, and peaks at night when most people tend to be reliably at a home base with an average probability of 90% (Fig. S6B). Thus, we make a reasonable assumption that a driver source is the zone where the user is mostly found from 9 pm to 6 am in the entire observational period. Batty, M. The size, scale, and shape of cities. Science 319, 769–771 (2008). Barthélemy, M. Spatial networks. Physics Reports 499, 1–101 (2011). Schrank, D. & Lomax, T. Annual urban mobility report (Texas Transportation Institute, 2009). Helbing, D. A section-based queueing-theoretical traffic model for congestion and travel time analysis in networks. J. Phys. A: Math. Gen. 36, 593–598 (2003). Chin, A. T. H. Containing air pollution and traffic congestion: transport policy and the environment in Singapore. Atmospheric Environment 30(5), 787–801 (1996). Rosenlund, M. et al. Comparison of regression models with land-use and emissions data to predict the spatial distribution of traffic-related air pollution in Rome. Journal of Exposure Science and Environmental Epidemiology 18, 192–199 (2008). Herrera, J. C. et al. Dynamic estimation of OD matrices for freeways and arterials. Technical Report (Institute for Transportation Studies, UC Berkeley, 2007). Herrera, J. C. et al. Evaluation of traffic data obtained via GPS-enabled mobile phones: the mobile century field experiment. Transportation Research C 18, 568–583 (2010). Shen, W. & Wynter, L. Real-time traffic prediction using GPS data with low sampling rates: a hybrid approach. IBM Research Report RC25230 (2011). Barthélemy, M. & Flammini, A. Modeling urban streets patterns. Phys Rev Lett 100, 138702 (2008). Youn, H., Gastner, M. T. & Jeong, H. Price of anarchy in transportation networks: efficiency and optimality control. Phys Rev Lett 101, 128701 (2008). Li, G. et al. Towards design principles for optimal transport networks. Phys Rev Lett 104, 018701 (2010). Wu, Z., Braunstein, L. A., Havlin, S. & Stanley, H. E. Transport in weighted networks: partition into superhighways and roads. Phys Rev Lett 96, 148702 (2006). Rosvall, M., Trusina, A., Minnhagen, P. & Sneppen, K. Networks and cities: an information perspective. Phys. Rev. Lett. 94, 028701 (2005). Jiang, B. Street hierarchies: a minority of streets account for a majority of traffic flow. International Journal of Geographical Information Science 23(8), 1033–1048 (2009). Brockmann, D., Hufnagel, L. & Geisel, T. The scaling laws of human travel. Nature 439, 462–465 (2006). Belik, V., Geisel, T. & Brockmann, D. Natural human mobility patterns and spatial spread of infectious diseases. Phys. Rev. X 1, 011001 (2011). Kölbl, R. & Helbing, D. Energy laws in human travel behavior. New Journal of Physics 5, 48.1–48.12 (2003). González, M. C., Hidalgo, C. A. & Barabási, A.-L. Understanding individual human mobility patterns. Nature 435, 779–782 (2008). Song, C., Qu, Z., Blumm, N. & Barabási, A.-L. Limits of predictability in human mobility. Science 327, 1018–1021 (2010). Eagle, N., Macy, M. & Claxton, R. Network diversity and economic development. Science 328, 1029–1031 (2010). Lu, X., Bengtsson, L. & Holme, P. Predictability of population displacement after the 2010 Haiti earthquake. Proc. Natl. Acad. Sci. USA 109, 11576–11581 (2012). Lambiotte, R. et al. Geographical dispersal of mobile communication networks. Physica A 387, 5317–5325 (2008). Sevtsuk, A. & Ratti, C. Does urban mobility have a daily routine? Learning from the aggregate data of mobile networks. J. Urban Technol. 17, 41–60 (2010). Batty, M. Cities and Complexity: Understanding Cities with Cellular Automata, Agent-Based Models, and Fractals (The MIT Press, 2007). Chen, M. & Alfa, A. S. A Network design algorithm using a stochastic incremental traffic assignment approach. Transportation Science 25, 215–224 (1991). Newman, M. E. J. A measure of betweenness centrality based on random walks. Social Networks 27, 39–54 (2005). Porta, S. et al. Street centrality and the location of economic activities in Barcelona. Urban Studies 1–18 (2011). Strano, E. et al. Street centrality vs. commerce and service locations in cities: a kernel density correlation case study in Bologna, Italy. Environ. Plan. B: Plan. Design 36, 450–465 (2009). Kurant, M. & Thiran, P. Layered complex networks. Phys. Rev. Lett. 96, 138701 (2006). Dijkstra, E. W. A note on two problems in connexion with graphs. NumerischeMathematik 1, 269–271 (1959). Travel Demand Modeling with TransCAD 5.0, User’s Guide (Caliper., 2008). The authors thank A.-L. Barabási, H. J. Herrmann, D. Bauer, J. Bolot and M. Murga for valuable discussions. This work was funded by New England UTC Year 23 grant, awards from NEC Corporation Fund, the Solomon Buchsbaum Research Fund and National Natural Science Foundation of China (No. 51208520). P. Wang acknowledges support from Shenghua Scholar Program of Central South University. PW and MG designed research; PW, TH, AB and MG performed research; PW, KS and MG wrote the paper.